Optimum Security provides professional, reliable security services to homeowners and commercial clients throughout Fort McMurray, AB. We are committed to delivering effective, responsive protection for our discerning clients, and we have quickly earned a reputation as the most reliable private security company in Alberta. Our team of highly-trained, uniformed security guards have undergone rigorous background checks and advanced training in communication, risk assessment, asset protection and threat management. 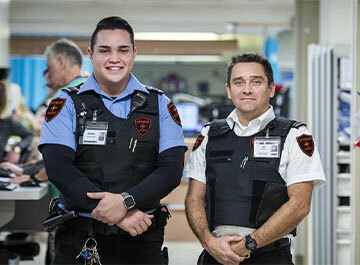 Our officers are in excellent physical condition, and they have extensive experience in dealing with complex protection assignments involving labour disputes, high-value assets, V.I.P.’s, and other demanding situations. We provide a full range of customizable asset protection solutions for our business clients throughout Fort McMurray, including retail outlets, construction sites, work camps, and offices. Whether you need on-site uniformed officers to control access, mobile patrol services to inspect the perimeter of your property, a CCTV system to record activity, or a combination of all these services, we can design an effective, comprehensive plan that fits your unique operational requirements. Make your next Fort McMurray special event a successful one with the support of our uniformed security guards. We provide professional, responsive security services for corporate events, weddings, graduation parties, grand opening celebrations and more. Our security guards are available to monitor access to your event, provide traffic management service, and prevent unauthorized access. Optimum Security provides complete home security installation and 24/7 monitoring services for Fort McMurray homeowners. Our advanced systems monitor your home for threats including home invasion, fire, carbon monoxide leaks, flooding, and smoke. To learn more about how Optimum Security can provide professional, effective security solutions for your Fort McMurray home, business, or special event, call us at (780) 995-9229 to schedule your free security consultation today.